an Historical, Doctrinal, Moral, and Liturgical Exposition or Catholic Religion. translated from the French of Abbe Gaume by Rev. F. B. Jamison. 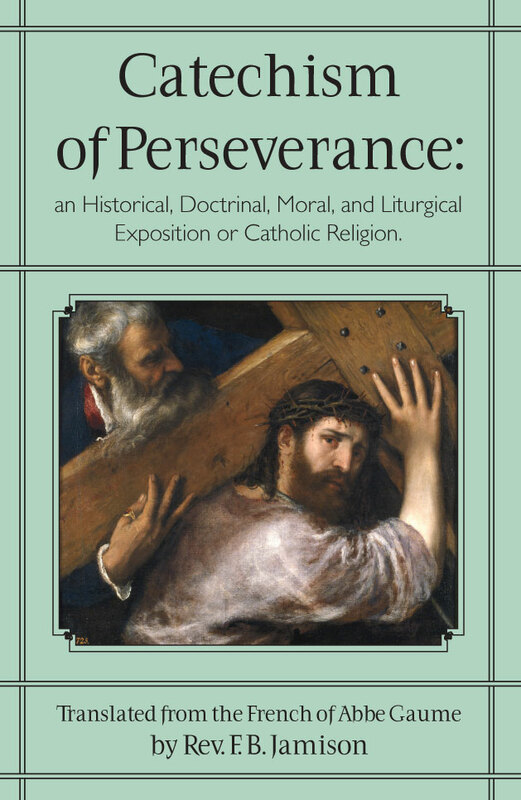 The great merit of the Catechism of Perseverance as a text-book for the more advanced instruction of young persons in the history, doctrines and practices of the Christian religion, has been universally admitted. The plan followed by the author is such as to facilitate very much the acquisition of this necessary knowledge, by presenting a connected idea of religion from the creation of man to the end of time. For a more particular explanation of his method, we refer the reader to his introductory remarks. The first edition of the abridged work in English was received with the warmest commendations of the press. In presenting it again to the public, we beg leave to state that it has undergone a careful revision, and many inaccuracies of expression have been corrected. A table of contents has also been added, which will be found very convenient in a book containing so many details. We offer it therefore with confidence to the Catholic community, hoping that it will meet their approbation and answer the important ends for which it was designed. Imprimatur 1850, 413 page book.